Perhaps someone out there will be able to recognise the model and date of this fabulous old vehicle – if so, please leave a comment. The photo can be enlarged. I’ve had a quick trundle around the web, and think it’s perhaps a pre-1963 number plate, but not sure. The photo is thought to date from the late 1960s-early 1970s. 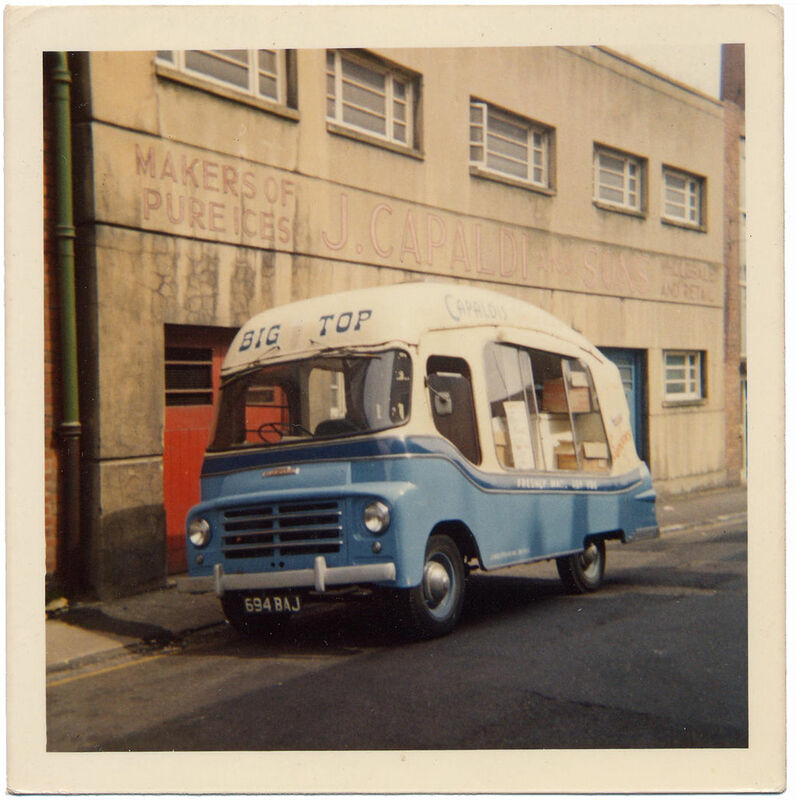 It’s good to see the Fetter Lane factory captured on camera when still very clearly in business, and with that lovely lettering intact, painted in appropriately pale ‘ice cream’ colours. Many thanks to Jamie for the photo. Scroll to the bottom of the page and you will see a very similar ice cream van. Thanks Graeme. I’m amazed at how many different models of ice cream van there are (or were). for the other York photos added. This van is a 30cwt Austin LD. Economica van body by the Motor Delivery Co , in Northallerton. Hope this is some help on those Lovely old vans from our past. Noel. Noel, I had been researching my uncles old van which I believe to be very similar to the van above. You’ve been quite specific on the model and wonder whether you’re an ex employee. If live your views on my uncles van of I could message you a photo. I’d really appreciate that. Many thanks. Hi Darrin, Sorry for not getting back to you sooner I forgot all about this post until Lisa@yorkstories sent me an e-mail. Well Darrin there is not much i can add other that i am not a former employee, I live in Belfast and interested in ice cream vans from the 60’s & have a large collection of pictures, mainly from the internet, This interest comes when i grew up in the 60’s my Dad had a few soft ice cream vans LDs and Bedford CAs, And for a while a small fleet of franchised Mr Whippy commers. Sorry i cant shed any more light on your uncles van. Any pics of your uncles van or any other vans would be very much appreciated, Your’s Sincerely. Noel McCullough. 694 BAJ was registered between Nov 61 & Jan 1962. “AJ” was issued in the North Riding of Yorkshire.